2014-2015 Nursing Education Statistics Report - Canadian Association of Schools of Nursing / Association canadienne des écoles de sciences infirmières (CASN / ACESI). 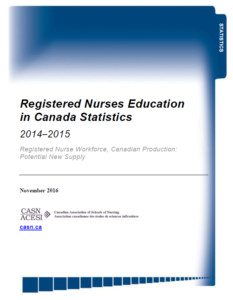 The Canadian Association of Schools of Nursing (CASN) is pleased to present Registered Nurses Education in Canada Statistics, 2014-2015 — Registered Nurse Workforce, Canadian Production: Potential New Supply. This annual report supports health human resources planning in both the nursing service and nursing education sectors. It represents the fruit of a strong partnership among national and provincial/territorial bodies and effective collaborative relationships with multiple stakeholders. NOTE: An updated version of the final report was uploaded on March 2, 2017. A correction was made to Table A 2014 data.